Kurdish fighters battling Islamic State (IS) militants in the town of Kobane on the Syria-Turkey border have captured a strategic hilltop, reports say. The UK-based Syrian Observatory for Human Rights and local officials said Kurdish units gained control of the hill after fierce clashes. The Mishtenur hill overlooks the embattled town. Monitors from the Observatory said its capture meant that key IS resupply routes were within the line of fire. 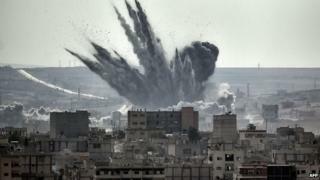 The Observatory said 11 Islamic State fighters were killed and large quantities of weapons and ammunition were seized. A Kobane-based Kurdish official told the Associated Press news agency that the clashes had led to casualties on both sides. Recapture of Mishtenur hill could prove to be a defining moment for the fate of Kobane, in the normally very slow pace of the war, says the BBC's Guney Yildiz. It shows Kurdish fighters are able to confront IS in rural parts at the outskirts of the city despite the long-range weapons the jihadist militants have, he adds. IS militants have been trying to gain control of Kobane since September, but have been meeting fierce resistance from Kurdish fighters. Hundreds of people have been killed and more than 200,000 refugees have fled into neighbouring Turkey. In recent weeks Kurdish units have been advancing with the support of anti-IS air strikes conducted by the US-led coalition.